Fresh-baked pies are a welcome complement to any meal, but getting them to the table can be time-consuming. Before the finished pie can go into your oven the pastry must be made, rolled and cut, and the filling must be both prepared and -- often -- cooled. Preparing several pies at once and freezing them for later use is one way to simplify the process. Pies can be frozen either baked or unbaked, even if you're working with previously-frozen fruit. Many cooks and bakers are reluctant to re-freeze ingredients that have previously been frozen and thawed. There are two primary reasons for this. One is that freezing and re-thawing creates the possibility of microbial activity, and with it the risk of foodborne illness. A second is that repeated freezing and thawing cycles can cause food's texture to deteriorate. Food safety is seldom a concern in the case of pies made with frozen fruit, because any molds or bacteria are subsequently killed by the baking process. Texture is a non-issue as well, because baking the fruit has a larger impact that re-freezing. When fruit is frozen the water contained within its cells expands, rupturing some of the cell walls. When the fruit is thawed juices escape from these damaged cells, making frozen fruit juicer than fresh. Bakers must compensate for that by either draining and concentrating the juices, or by thickening them with starches such as cornstarch or flour. Cooked fillings made with frozen berries are more problematic, because cornstarch and flour release some of the moisture from the pie filling after they're frozen and thawed. Tapioca starch and commercial gelling products are more suitable choices for those pies, and can be ordered from baking supply shops or online vendors. Remove your pies from the oven, and let them cool completely before you freeze them. To avoid condensation, they should be frozen uncovered or loosely covered, then bagged or wrapped individually once they're fully frozen. You can remove the frozen pies from their pans if you wish, or leave them in the pan to protect them from accidental damage. A pie that's well-wrapped in airtight packaging should retain its flavor and quality for four to six months in your freezer. 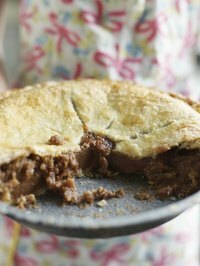 To reheat a pie, return it to its pan and let it stand for one hour at room temperature. Bake it at 350 or 375 degrees Fahrenheit until fully heated and bubbling, usually 35 to 50 minutes. Whether you choose to freeze your fruit pies baked or unbaked is largely a matter of personal preference. Fruit pies frozen unbaked have a fresher fruit flavor than fully-baked pies, which after reheating leave the fruit tasting thoroughly cooked. On the other hand, fruit fillings often have time to soak into the bottom crust before an unbaked pie is fully frozen. When baked, those pies will have a soggy, doughy crust. Fully baked pies are less likely to be soggy, because the crust is fully cooked and the filling fully thickened before they go into the freezer.